The Athletic Sports Complex will be built at JC Adams Municipal Park. Already located at the park are 3 softball fields (Huckaby Softball Complex), soccer field, 2 fish ponds, park shelter and playground. 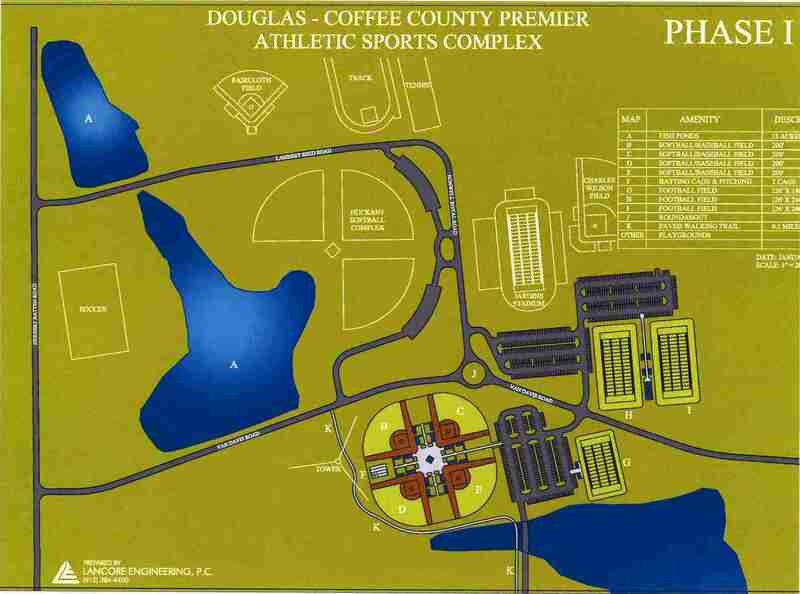 In addition to renovations and repairs to the existing areas, Phase I plans include adding 3 football fields, 4 - 200’ baseball/softball fields, batting and pitching cage, concession stand, bleachers, scoreboards, lighting, a playground, a ½ mile paved walking trail, additional paved parking lots, and an asphalt roundabout. For additional information, please contact the Douglas Coffee County Parks and Recreation Department at 912-384-5978 or the City Manager’s office at 912-389-3401.